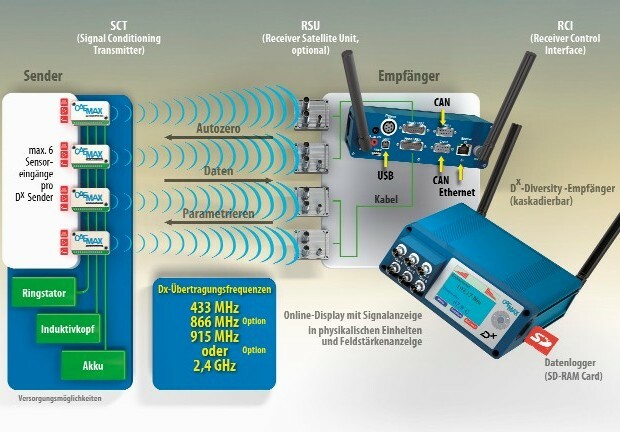 A highlight of CAEMAX´s new, fully digital DX telemetry is the ability to perform an absolutely synchronous data acquisition with several transmitters in one single ISM band. With one single telemetry transmitter up to six channels – e.g. two strain gauge full bridges or four half bridges or analogue signals or temperatures can be transmitted. The max. sum sampling rate is 7,2 kHz. Clearly structured menus provide easy handling even for the unexperienced user. The system supports either manual configuration at the receiver console or remote control by an integrated web browser. A variety of solutions is available for the power supply of the transmitter: Inductive head or ring stator for continuous operation as well as accu packages or various battery solutions which allow a secure power supply over hours or even days.